Are you looking for the best exterior shutters to meet your needs? Step One: Decide which material will be best for your needs and budget! You have found an excellent site to purchase your exterior shutters from since we sell every one of the following shutters that are mentioned and will ship them directly to you. Larson Shutter has a huge selection of exterior shutters, styles, and materials however the first question you will need to answer is, what material will best meet my needs? There are four basic materials that exterior shutters come in and each has its advantage depending on what is most important to you. Vinyl shutters: Least expensive, for decoration only and generally considered maintenance free. Can be used in high moisture areas. Exterior vinyl shutters cannot be hinged for use in functional situations, they are for decorative use only. Aluminum Shutters: Usually more expensive than vinyl shutters but much stronger and can be used as working functional shutters. Composite Shutters: Depends on the material but are usually more expensive than vinyl or aluminum, however will usually look more like a wood shutter but should be less maintenance than a wood shutter. Most can be used as working shutters with if used with optional hinges for functional use. Most can be used in high moisture areas with good results. Wood shutters: Simply put "Wood Is Real", of course it depends on the type of wood and construction technique used but should last for many years. Wood Shutters will however will definitely require more upkeep and refinishing than the previous types of shutters. Can be used as functional working shutters when installed with hinges and hold backs. Step Two: Make your choice on which basic shutter style will meet your aesthetic or functional goals! The first question dealt with the type of material you will use and relates to the cost and length of time your shutters will last. This second step is an aesthetic choice and will deal with the style of your shutters. Of course this step can be influenced by the historic architectural style of your house along with simply what style of exterior shutters that appeal to your taste. 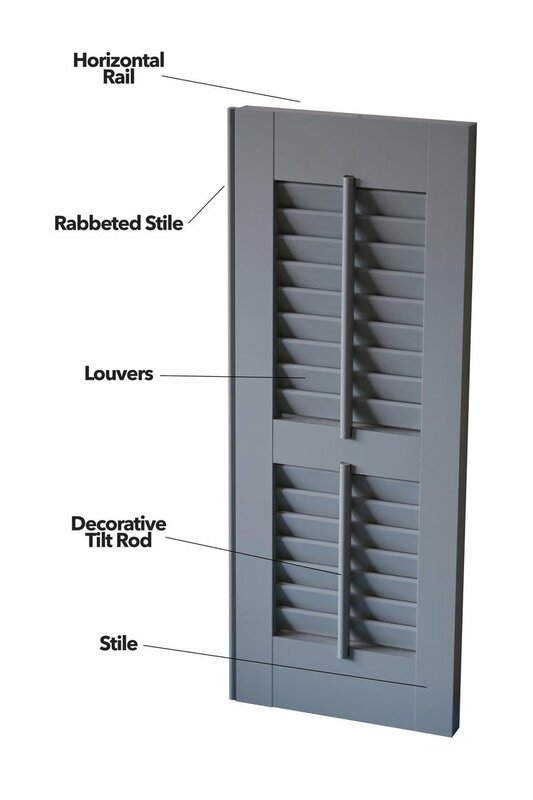 Below are the basic styles of shutters available, however we have many variations on each of the styles listed. Louvers: Probably the most popular style of shutters available. Louver shutters have horizontal slats that are usually placed in the shutters in a slightly fixed open position. Some wood louver shutters have a working tilt control rod that actually opens and closes the louvers. Raised Panels: Second or equal to the popularity of the louver style and is distinguished by solid panels which you cannot see through. We have many variations on the panel style which ranges from raised panel detail, flat panels with no detail or other styles including vertical or diagonal "V" grooves in the panel. Many custom options are available to make your shutters one-of-a-kind. Combination Louver/Panel: Combination louver panel shutters are exactly as it sounds, a combination of the two styles of exterior shutters. You could specify louvers in the top portion of your shutters and raised panels in the lower section or vice versa. Board and Batten: These shutters are very versatile and have vertical boards with horizontal battens across the shutters. Many variations are available such as a "Z" bar that is reminiscent of barn doors. Vertical board widths can be specified on some materials to give you different Aesthetic styles. Framed Board and Batten: This is a variation that combines the framed look of a raised panel shutter with the board and batten shutters vertical boards. Sometimes this shutter style is refereed to as a Framed Grooved Panel Shutter. Bahama Shutters: Sometimes referred to as Bermuda Shutters. They are hinged at the top and angle down over the window. The bottom of the Bahama is held out at an angle by stays (arms) that can be removed so that the shutter can be closed against the window. If the camel brackets that hold the arms in place is installed correctly you will be able to lock the Bahama shutter into place when closed by putting one of the pins that were removed from the arms back into the brackets. We will be adding to this page in the future and provide more information about each of the choices you have regarding shutter material and styles.